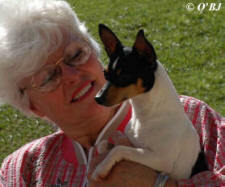 So how much does a Toy Fox Terrier puppy or retired show dog cost? Are adults or retired show dogs ever available? What about health guarantees? It depends on the breeder but let me ask you something. Do you want a distinctive companion, a burglar alarm with teeth, a forgiving friend who listens, understands you and never borrows money? Probably not enough money in the world to buy that - unless we're talking about a dog!!! That's why they're called Man's Best Friend. So What's The Price? Are you showing to win? Maybe you don't have time for the show ring, you just want the best personal companion, one who is welcome everywhere, doesn't eat crackers in bed, and is the ultimate conversation opener? Well, I have eight of those! They take turns going to the beauty shop with me or riding in the cart at Home Depot! 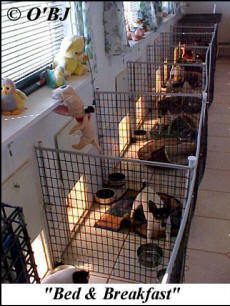 Puppy mill produce is cheap but if you want a lovingly reared, socialed, healthy puppy, keep reading. Toy Fox Terrier puppies average $1600 but can cost more if you want the best. Whether you only want a healthy family pet, or you also plan to show in Conformation, Obedience, or Performance sports, you want a well-bred, genetically healthy and lovingly nurtured puppy. Guarantees. Every puppy is born in my bedroom or office, depending or whether I'm sleeping or working. They are reared according to 52 years of proprietary methods that insure optimum physical and mental development. My guarantee exceeds that of a $70,000 automobile because a well-bred puppy is worth more and lasts a whole lot longer! I guarantee your Toy Fox Terrier will grow up strong, healthy, and handsome. If you have bought a show dog, I guarantee it can attain a championship and reproduce. How Are My Toy Fox Terrier Puppies Raised? At 21 days, when the dam would be returning from the hunt with a belly full of meat, my puppies get their first taste of raw meat, hand fed while in my lap. While I balk at regurgitating partially digested meat for them (that is their mother's job) their first solid food is what nature intended for a carnivore, not corn and wheat! We greadually introduce goat's milk, eggs, vegetables, raw beef bones for teething, fruits, and finally, for convenience, a small amount of kibble. We expect owners to do no less. 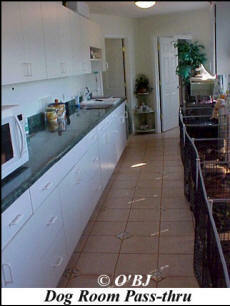 The Dog Room is a pass-through between my den and the home-based plumbing-now-web-publishing office. It is the pathway of daily activity so they are fussed over by our staff, sales, and service people. When nothing's going on, they sun bathe on their outside hammocks or in winter, they curl up in custom made beds on radiant-heat ceramic floors. All 8 of my dogs share house time and work as official greeters. "Toy Fox Terriers O'BJ" run and play together in a half-acre carefully tended Bermuda grass paddock in clean mountain air. No, we don't rent rooms but we are the best dog-gone Bed and Breakfast in North Carolina! When Do I Get To Choose Puppy? I'll send you lotsa photos, from the first week and every couple of weeks thereafter. I describe each puppy's personality and character as they develop, and by the 6th or 7th week, I'll be able to price them. Then, depending on the order in which your deposit was recieved, you will choose a first and second pick puppy and start making travel arrangements! When Can I Come Get My Puppy? Rarely before 9 weeks. Pet or Show, every O'BJ puppy must learn the social skills only a good mother dog can teach. Play manners, pecking order, and "pack" interaction insures a better adjusted companion that gets along well with children and other pets. Having been taught by his dam, he will understand the limits you impose. Hopefully, there will be limits. Can My Toy Fox Terrier Be Shipped? We've flown Akita puppies to four continents and it's as safe as any of us can be. Shipping may be cheaper than a road trip, and obviously the puppy gets home quicker. I charge $250 to partially cover the vet exam, USDA health certificate, and the day trip to Charlotte International Airport. You pay for shipping and the crate which will serve as his "den" at home. Alternatively, picking up the puppy means we get to meet you, you get to see sire, dam, and the whole family. A Word About Showing. We love to share in your fun but I don't push anyone to show. Another champion to my credit doesn't matter. We've established a lot of AKC records, including one that will stand for 100 years: Breeder of the Best Male and the Best Female Akita in the historical 1984 AKC Centennial All Breeds Show! If we need another ego boost, we'll ask for your help in 2084. If you want top quality but don't plan to show or breed, that's okay. We just want you to enjoy your Toy Fox Terrier in ways that make YOU happy with no pressure from a breeder. We have friends who collect classic cars because they love having them in the garage. I'm equally as happy with a classic dog curled in my lap! And why not? It's much more satisfying than objects d’art. Can a painting hug you back??!! Does a statue follow your every step? Most people only wear their precious jewels on special occasions. I delight in mine every day!! 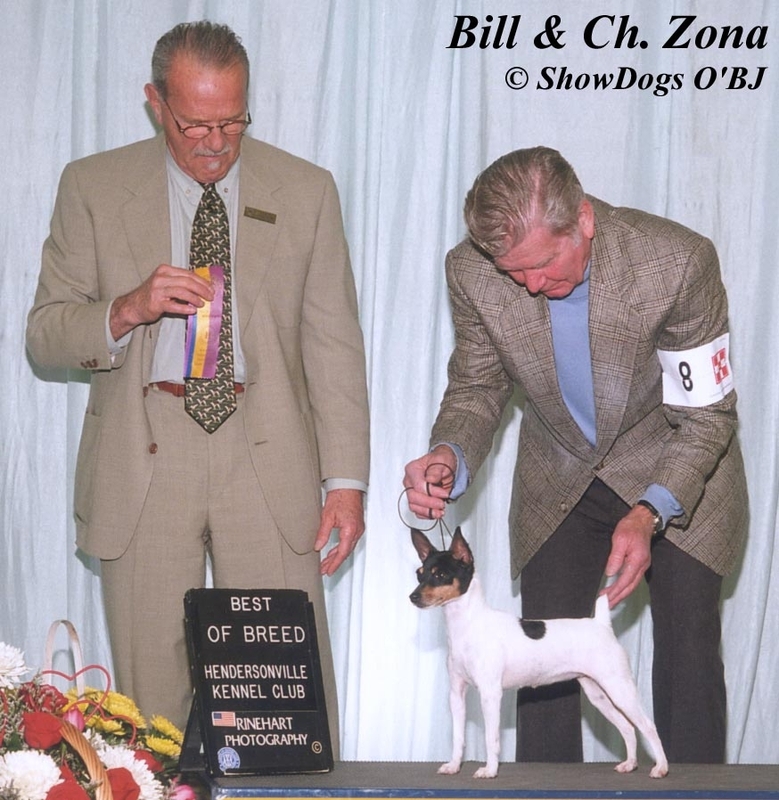 So whether he's going to be your personal companion or wow 'em in the show ring, an O'BJ Toy Fox Terrier has "credentials". My puppies (like AKC show-ring record setter Hugely) are created through decades of design and attention to detail. If you're debating between a show quality puppy or a family pet, see Why We Show Pets. You should also check out The Breeder's Pedigree. 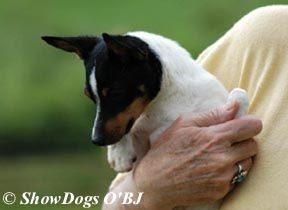 If you've given this a lot of thought and want to add an O'BJ Toy Fox Terrier to your family, Sucha's puppies were born February 3rd, 2019, and will be ready to go in April. Also, check out her 2017 litter by Rolex. Get in touch now to make your deposit on your pick puppy!